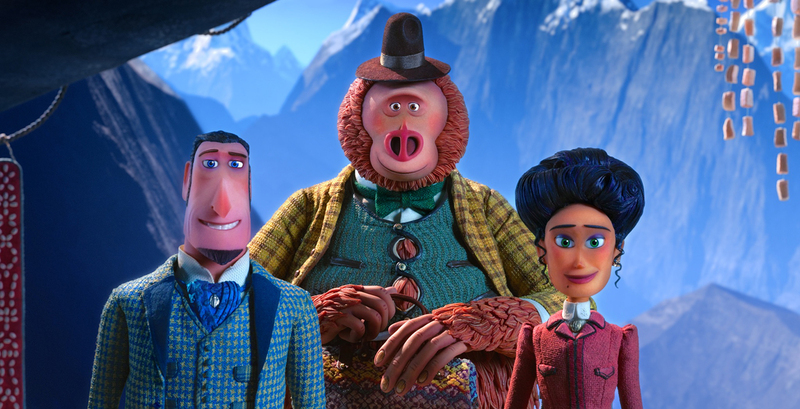 (L to R) Sir Lionel Frost voiced by Hugh Jackman, Mr. Link voiced by Zach Galifianakis and Adelina Fortnight voiced by Zoe Saldana in director Chris Butlers MISSING LINK, a Laika Studios Production and Annapurna Pictures release. LAIKA Studios is well known for delivering quality stop-motion animation and top notch storytelling. If there is a common thread between the films in the studio’s decade-long run, it’s their offbeat and outsider characters, who search for a purpose and uncover a catalyst for change within themselves. With varying degrees of narrative and character complexity, each film stands as a benchmark thanks to the craft and care put in by the animators and storytellers. While writer-director Chris Butler’s MISSING LINK is a tad slight when it comes to narrative gravitas and character pathos, it’s ultimately entertaining, humorous, light-hearted revelry. Bumbling explorer Sir Lionel Frost (voiced by Hugh Jackman) is on a quest to discover the world’s mythical, one-of-a-kind creatures. But so far, his attempts to capture evidence of these legendary beasts have been fruitless. It’s led him on a globe-trotting adventure into dangerous circumstances, like the precarious position his former assistant found himself in with the Loch Ness Monster. Frost covets membership in an elite explorer’s club, but they don’t exactly welcome him into their ranks – and their leader Lord Piggot-Dunceb (voiced by Stephen Fry) is determined to keep him out. The pair make a wager: If Frost can capture the elusive Bigfoot, he can finally gain entrance into the explorer’s society. It’s not long before Frost finds what he’s been searching for deep in the remote forests of the Pacific Northwest: Mr. Link (voiced by Zach Galifianakis). But what Frost didn’t know is that this gigantic, hairy orange sasquatch talks and has a very literal personality. Not only that, he’s lonely and yearns to find his fellow mythical creatures, the Yetis, to see if they’ll accept him. “As your world grows bigger, mine’s eaten away,” he sadly states. Frost accepts his new pal’s desperate plea for help and sets out on yet another quest. Along with a former friend’s feisty widow, Adelina Fortnight (voiced by Zoe Saldana), Frost and the poorly-disguised Mr. Link set out to uncover the secretive enclave of Shangri-La located in the frozen, treacherous Himalayas. However, Dunceb is determined to make the journey harder and sends ruthless hitman Willard Stenk (voiced by Timothy Olyphant) after Frost and company. Butler’s film is a buddy comedy and road picture wrapped into one, and it nails the tones of both perfectly. There are a few strong comedy bits and shenanigans, seemingly influenced by classic comedy acts like Laurel and Hardy and Abbott and Costello, where the two banter about misunderstandings. The duo’s aesthetics also heavily hint at that dynamic. There are also fish out of water jokes Butler doesn’t leave unexplored, particularly when it comes to how Mr. Link relates to other humans and their world. There are no missteps when it comes to any of the comedic absurdity. Plus, it’s a blessing that there’s also no damsel in distress. Adelina, though she occasionally borders on a sassy Latina stereotype, is fiercely independent and self-sufficient. Her goal isn’t to wind up in the arms of a man, but rather to blaze her own trail, albeit with the research of her dead husband guiding her way. Resonant themes of selflessness all congeal in the third act instead of being nimbly layered throughout. Although Frost’s character growth is all about becoming a less selfish person, his realization he’s mistreated people around him is rushed. Commentary on the small-mindedness of the old school, upper-crust society is assuredly there, but is treaded upon a smidge too lightly, despite the obsession to see evolutionary advancements disproven leading to one character’s destruction. The world Butler and company have built is thoroughly impressive. The style and artistic panache they’ve created is entrancing and enveloping. Character and costume design is expressive and tangible. Yet still, we’re left longing for deeper thematic territory to be explored.